The local news sites being developed by Yahoo, AOL, Huffington Post and a growing number of other online players will dash the hopes of most newspaper publishers of charging for access to their online content. While newspaper executives have agonized for the better part of two years about whether and how to charge for their costly-to-produce content, every indication is that the portals, local broadcasters and other media companies have no intention of asking anyone to pay for access to the increasingly ambitious local sites they are building. With a fast-proliferating number of respectable local sites giving away news to build traffic for their ad-supported ventures, newspapers simply won’t be able to charge for access – especially when their own stories are likely to become freely available within minutes at any number of competing sites. The local news land rush gained a formidable entrant last week when it became clear that Yahoo is getting ready to launch a major local news site in San Francisco. As reported first here and here, Yahoo spent some $90 million to acquire Associated Content to begin filling its local sites with tons of inexpensively produced content. Yahoo joins such up-and-running efforts as AOL’s Patch.Com, MSNBC’s Everyblock.Com, Huffington Post (example: HuffPost-New York), and the ever-more-elaborate local sites operated by television and radio broadcasters (example: NBC Philadelphia). This is not to mention the hundreds of local sites operated by individuals (West Seattle Blog), funded by philanthropists (MinnPost) and backed by venture dollars (Outside.In). In the San Francisco area alone, the Graduate School of Journalism at the University of California at Berkeley has identified more than 250 local sites. 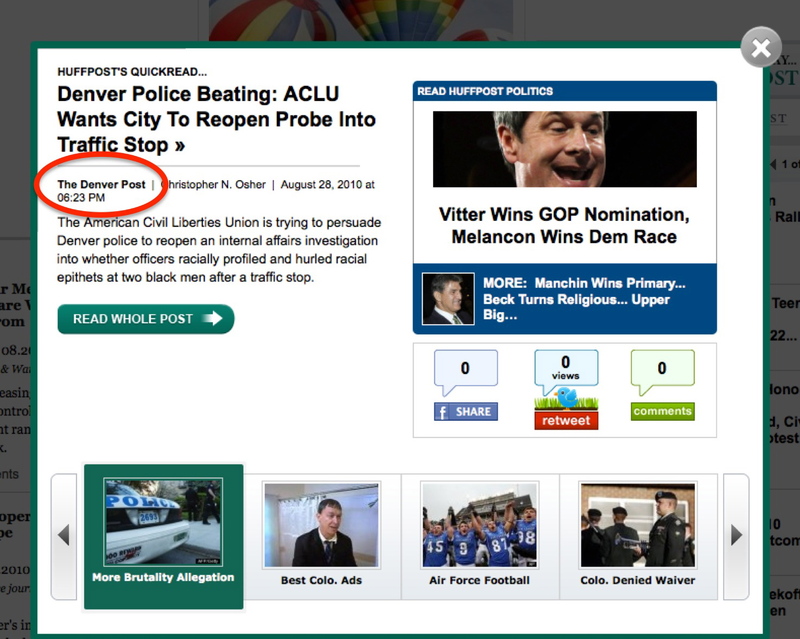 A Denver Post story about accusations of racial profiling by police was featured prominently yesterday on the HuffPost’s Denver page. A click on the story led to a one-paragraph summary of the article and a link to the original piece (see screen grab below). For many readers, the HuffPost summary would be sufficient, thus depriving the Post of the traffic it otherwise might have earned. Beyond matching newspaper stories, AOL and Yahoo intend to leverage citizen journalists to fill their sites with inexpensively produced original content. In its initial email effort to recruit writers in San Francisco, Associated Content promised $10 for the first article. Armies of low-paid writers Patch-ing together copy like this yarn about a federal raid on the office of a Connecticut foot doctor likely will provide enough free local content in many major markets to satisfy all but the most voracious and discerning news consumers. With newspaper advertising revenues this year on track to come in at less than half the record $49.4 billion achieved in 2005, publishers have been toying with the idea for quite some time of charging for access to their websites. Given that all but the most parsimonious newspaper pays more than $10 per story, you can’t blame publishers for wanting to recover the costs of creating content by charging for the online news that most of them have been giving away for free for 1½ decades. However, the few brave publishers who have tried to charge for content have met with less than encouraging results. Newsday famously got only 35 takers when it initially imposed a fee to visit its site (but it did not care, because it still provides free access to subscribers of the newspaper and the Internet service provided by its owner, Cablevision Systems). The Valley Morning Star in Harlingen, TX, lost nearly half of its web traffic when it started charging for content in July, 2009, according to statistics published at Quantcast.Com. Although the paper resumed free web access in April of this year, its traffic only recently recovered. Combine consistently demonstrated consumer resistance to pay with a plethora of plausible free alternatives and there can be little doubt that charging for day-to-day news coverage – even sparkling local coverage – is not likely to be a fruitful path for most general-interest newspapers. Instead of putting cycles into exercises like charging for access to obituaries, publishers need to focus their marketing power, content-creating resources and ad-selling capabilities on developing unique print, web and mobile products that will be valued by consumers and advertisers alike. For anyone other than publishers of mission-critical business or government news like the Wall Street Journal and possibly the New York Times, pay walls will not fly. It is time for everyone else to move on to more productive pursuits. Moving quickly to leverage its $90 million-ish acquisition of Associated Content, Yahoo has begun recruiting writers to begin building a local news site for the San Francisco area. Though hundreds of news shops of every shape and size already cover Northern California, Yahoo will be an instantly formidable competitor because of its vast market reach. A questionnaire soliciting personal interests and writing samples from potential contributors indicates that the site will cover crime, local news, politics, weather, traffic, transit, sports, business, local celebrities, personal-interest stories, events and things to do, nightlife, restaurants, social calendar, real estate and development, education. :: The full complement of traditional commercial mainstream print and broadcast media, as well as some long-standing alternative print media. :: Handsomely funded non-profit news operations like the Center for Investigative Reporting, Bay Citizen and KQED, that latter of which is a local public broadcaster that just announced plans to expand its local news operation. :: Some 245 blogs and hyperlocal news sites tracked by the Bay News Network project operated by the Graduate School of Journalism and Knight New Media Center at the University of California at Berkeley. Though Yahoo may seem to be late to the game, its standing as one of the top five busiest websites means it has far more power than any other competitor to drive traffic to its new local news site. It also has the capability to seek premium prices for the ads run on its local site through a system that targets banners to individuals based on their online behavior. The flagship newspaper produces barely half of the weekday audience delivered by some major metro publishers, according to an analysis of data recently issued by the Audit Bureau of Circulations. While papers like the Kansas City Star continue to pursue the traditional model of publishing only the main title and a free once-a-week advertising product sent to the homes of non-subscribers, the ABC reports that papers like the Chicago Tribune and Dallas Morning News have created such a wide variety of products that the flagship paper produces just 56% of the average weekday circulation in each of their respective markets. :: The first reason, which is bad news, is that newspaper circulation has nosedived in recent years. This results from a growing consumer preference for Internet and mobile news, as well as aggressive efforts by profit-challenged publishers to cut expenses by trimming the delivery of papers to distant readers and fickle customers who subscribe only as long as they can get deeply discounted rates. :: The second reason, which is good news, is that foresighted publishers are creating niche products to try to capture readers who historically were unlikely to buy the legacy newspaper – and, of course, the advertisers who covet them as customers. The Tribune and Morning News are examples of a trend that is likely to gather momentum as publishers forsake the ancient, one-size-fits-all newspapering model in favor of producing portfolios of print and digital products tailored to selected consumers and advertisers. 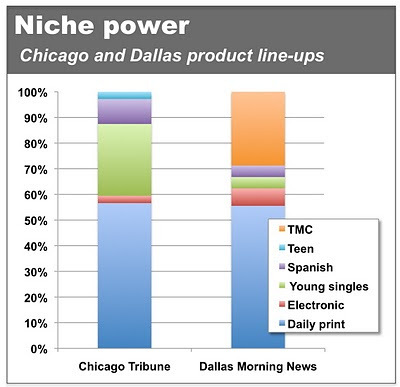 As illustrated below, the product portfolios of both the Chicago Tribune and Dallas Morning News include publications aimed at young adults and those who prefer to read Spanish-language publications. In a new wrinkle for the ABC, subscriptions to the electronic editions offered by both publishers also are counted in the daily and Sunday audience numbers. Beyond the products the publishers have in common, the Tribune publishes a free tabloid written by and for teenagers and the Morning News delivers a free, weekly TMC advertising product. TMC stands for total market coverage and such products usually consist of a bundle of free-standing ad inserts delivered to the homes of those who do not subscribe to the paper. For the time being, flagship newspapers – especially the Sunday editions often responsible for producing half the sales in any given week – are the dominant revenue driver for publishers. Given the likely future contraction of flagship circulation and the concurrent efforts of publishers to diversify as rapidly as they can, it may not be long before the once-mighty daily newspaper itself is just one of many niche products. With most newspapers drawing more than half their audience from people who are 55 years of age and older, you would think they would avoid insulting those readers. But you would be wrong. Although respectable media practitioners generally have learned to mind their manners when referring to individuals of different races, religions, genders, sexual orientation, physical capabilities and mental capacities, a notable lack of sensitivity persists toward people who have five, six, seven or more decades under their belts. A couple examples of Chronological Incorrectness occurred over the weekend in the New York Times, which is widely regarded as one of the most carefully edited papers in the land. If it can happen there, it can happen anywhere. So, listen up, whippersnappers. In the first instance of Chronological Incorrectness, the paper gratuitously stated that an 84-year-old woman quoted in a story was “lucid.” The woman was interviewed in connection with the coverage of the 65th anniversary of the classic sailor-kisses-a-woman picture that was snapped in Times Square on the day World War II ended. What’s the big deal? Glad you asked. Unless otherwise noted, I presume everyone interviewed for a New York Times article – as well as the journalist conducting the interview – is indeed lucid. To go out of the way to state that someone north of 55 is lucid is to buy into the decidedly false assumption that she is a doddering geezette. That is flat-out insulting to this individual and all her peers, who also, hands down, happen to be the most faithful customers that newspaper publishers have. Although the reference to the comic character was lighthearted, the use of the word “spry” is offensive, because it buys into the proposition – quite often unfounded – that those north of 55 are likely to be physically feeble or infirm. Thanks to advances in medical care (for those fortunate enough to afford it) and greater awareness of the dangers of processed food, the benefits of exercise and the insanity of smoking, today’s 55-plus crowd on average will live longer than any preceding generation. All signs indicate that this generation also will be actively engaged for many more years to come in the realms of commerce, government, education, non-profit pursuits and almost every other facet of society. Given the wretched turn in the economy in the last few years, those north of 55 will try to be actively engaged in the workplace – whether they like it or not – for far more years than any prior generation. In an example of the enduring influence of this generation on the body politic, more than three-quarters of the members of U.S. Senate are north of 55, with four in their eighties, 23 in their seventies and 34 in their sixties. As to another of the unfortunate misapprehensions about those north of 55, it should be noted that they are not technologically recalcitrant. Far from being fuddy-duddy Luddites, newspaper website visitors – as discussed previously here – actually appear to be early and passionate technology adopters. Greg Harmon of Belden Interactive, the foremost expert on consumer behavior at newspaper websites, has found in hundreds of surveys across the country that newspaper web visitors look exactly like consumers of the print product. The reason for this is that newspaper site visitors actually are the same people who read the print product – a not-so-fun fact that should shiver the timbers of publishers concerned about the long-term mortality of their predominant customer base. Eventually, you see, even spry people die. While smart newspaper editors and publishers are scrambling to diversify the demographics of their audience as fast as they can with any number of print, online and mobile products, the least they can do in the meantime is to respect the people who happen to be their very best customers. And that, until further notice, would be their elders. 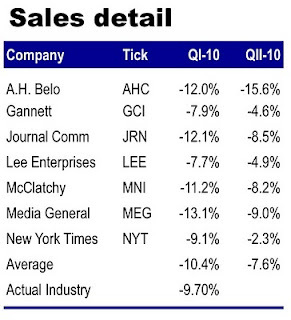 Advertising sales for most newspaper publishers were less bad in the second quarter of this year than they were in the first three months. But less bad is not the same as good – and the outlook for the remainder of the year is decidedly murky. 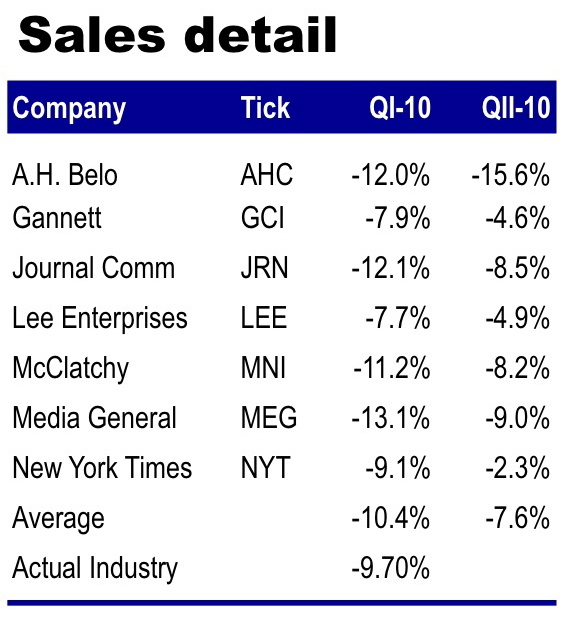 Based on the performance reported to date by the publicly traded publishing companies, it appears that sales for the industry on average will be down about 7% to 8% in the second quarter, making for the least-bad sales spell since the fall of 2007. Assuming that’s where the second-quarter numbers come in, the period will be an improvement from the 9.7% drop in print and online sales for the industry in the first three months of the year. And it will be far, far better than the 29.0% sales plunge in the second quarter of 2009, which represented the worst quarter in an unprecedented year when revenues dropped 27.2% for the full 12 months. Of the seven publicly held U.S. publishers who have released second-quarter earnings statements to date, sales were better in the second period for all but one. The exception, as you can see from the table at left, is A.H. Belo, where ad sales fell 15.6% after dropping 12.0% in the first quarter. The strongest performer was the New York Times Co., where a 1.1% gain at the flagship paper helped offset declines 0f 9.1% at the Boston Globe and 7.1% at its properties in the South and California. While the decelerating sales erosion in the first half of the year understandably cheered publishers and editors, it is not clear that the trend will continue, given an apparent slowdown in the recovery of the economy. As reported Friday by the U.S. Department of Commerce, the gross domestic product slipped to 2.4% in the second quarter of this year from 3.7% in the first period and 5.0% in the last three months of 2009. With classified advertising all but moribund at most newspapers, retail advertising is without question the most vital revenue source. If retail sales falter in the second half of the year – especially in the crucial fourth quarter when ad budgets traditionally peak for the holidays – the modest progress achieved by the industry in the first part of the year – assuming you call less-bad sales “progress” – could become a distant memory.